Is there a resource with the spectra of these dyes? provides an excellent introduction on how to dye with synthetic dyes. I was wondering if there is a resource with spectra of these dyes? I have a UV-vis spectrum of the A22 Sahara Sun and 2 Permabril dyes (yellow C2R and orange C3R, which I ordered before I found your website), but was wondering if there is somewhere where there are the spectra of other dyes e.g. the Procion Yellow MX-8G (the Permabril dyes I have have a bit of a shoulder on the peak, unlike the A22 Sahara Sun peak which is much cleaner). In case you are wondering, I am a scientist too. Have previously been working with photographic dyes though! Yes, I can give you the visible absorption spectra of many of these dyes, and the UV-visible absorption spectra are available for many more. 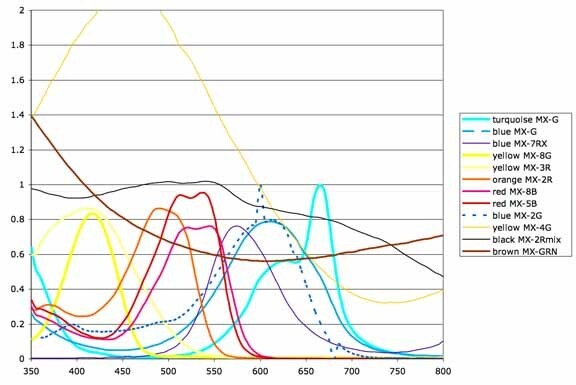 Years ago I borrowed a colleague's spectrophotometer to do some quick absorption spectrum scans for vials of dissolved dichlorotriazine dye, and Olli Niemitalo, who wrote the Dye Mixer Applet, has the UV-visible absorption spectra for many dyes in this class. (this is its permanent address). It's a wonderful resource for dyers. There is more explanation of it in the Dye Forum in a post entitled "How to use the Dye Mixer Applet". Permabril C dyes are the same dichlorotriazine fiber reactive dyes that every other dye manufacturer calls "M" or "MX", often headed with the description "cold fix dyes"; I suppose that the "C" after "Permabril" may stand for "cold". Permabril yellow C2R and Permabril orange C3R—oh, these names must be mixed up—Permabril Yellow C-3R is almost certainly Colour Index reactive orange 86 (not to be confused with reactive yellow 86, which is yellow MX-8G! ), while Permabril Orange C-2R is almost certainly Colour Index reactive orange 4. However, Permabril is Standard Dye's own brand name. My experience with Standard Dye is that they will commonly substitute a similarly-hued mixture of other dyes in the same class if they find it inconvenient to supply the dye that is ordered. If you order from them you must always be careful to specify the Colour Index name and make it clear if substitutes are not acceptable. "A Beautiful Blue: Procion Turquoise MX-G". 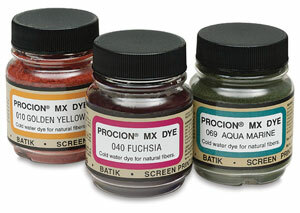 Do look at my page, "Which Procion MX colors are pure, and which mixtures?". This page lists alternative names for various dichlorotriazine dyes, but doesn't include the Permabril brand names which are kind of screwy. Standard was playing fast and loose with dye names even before they introduced the Permabril name, often inventing totally bogus MX codes, a practice which is common for other dye classes but almost unseen among manufacturers of fiber reactive dyes. For example, they sell violet MX-2R, reactive violet 14, under the name violet MX-G, for no apparent reason; "G" stands for "Gelb", or yellow, although a violet simply cannot be yellowish. (See "What do the letters and numbers in the code name for a Procion MX type dye mean?".) Don't get me wrong, Standard Dye sells good dyes and they can be good to buy dyes from, as long as you are clear about what you will and will not accept, but they have different standards about naming than I and probably most other scientists do.